Gone are the days when fishermen had to rely only on traditional wading vests to carry their gear. 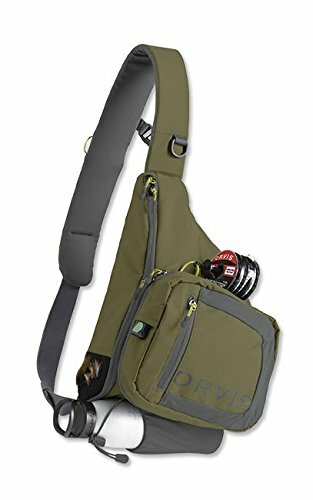 These days, if you’re going to go fly fishing, then you might as well bring a purpose-built fly fishing sling pack, with attention to detail that makes for a memorable experience. Features like nets, pliers, customized accessory attachments and fly-fishing pockets are all essential aspects of a good quality and well-made sling pack, and you’ll need one if you want to up your game and catch more fish. 1 Why Choose a Sling Pack? Why Choose a Sling Pack? 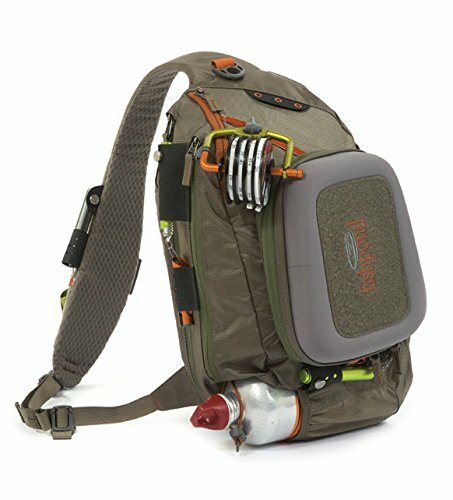 Fly fishing packs are available in a wide variety, and some of the options range from the obvious sling pack to waist packs, chest packs and hip packs, and all offer different benefits. However, we’ve gone with the sling pack because it offers way more benefits than the other options. To give you an idea of what we’re alluding to, check out our comparison of sling packs to other types of fly fishing packs and see for yourself why we chose the sling pack above all the others. A sling pack can hold as much gear as needed, and you can easily rotate it from the back to the front to effortlessly access that gear whenever you need it. Chest packs, on the other hand, come in different sizes with the most common ones being small and they don’t have the same carrying capacity as sling packs, while the big ones tend to be bulky and can get in your way while you’re fishing. Waist and hip packs are quite similar and can both be rotated from the back to the front to access your fishing accessories conveniently. However, you should also know that waist packs have a slight disadvantage in that they will get waterlogged when you wade in the waist-high water, which then makes for an annoying trip. So, your best bet is to go for a sling pack because it has much more to offer for fly fishing anglers than the other options. Just be sure to get one with adjustable straps so that you can get it out of harm’s way when you’re wading in deep water. 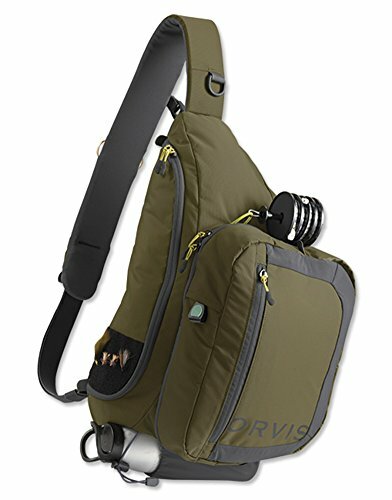 As with any purchase, you should know what to specifically look for when shopping for a fly fishing sling pack. The accompanying highlights are some of the most noticeable features to consider. A good quality sling pack should offer you a lot of storing options for different gear, from dividers to attachment areas and gear-specific pockets, tipped spool holders and straps for your rain gear and water bottles, etc. In addition to having the right type and amount of storage options, the sling pack you choose needs to have enough room to suit your needs as well. It won’t do to purchase a sling pack that won’t fit rain gear if you are fly fishing in the rain, while a big sling pack might seem and feels too bulky for a relatively short trip or a beginner. Usually, this wouldn’t even be a question for an angler, because logically the waterproof option seems like the way to go. You will be on the water after all. Surprisingly, there are benefits to both options in this regard. With a waterproof sling pack, you’re guaranteed to keep your gear and any devices you might be carrying dry, so you don’t have to worry about damage to anything of value. The trade-off with these is that they don’t come with the variety of pockets and add-ons needed to carry everything that you need, while non-waterproof sling packs come with pockets galore! Quality construction and durability are non-negotiable. During your fishing trips, the sling pack will be exposed to various harsh conditions, and it has to be durable enough to handle the elements. If you’re going for the waterproof variety, look for ones constructed from durable ripstop nylon or strong TPU welded plastic, with DW﻿﻿R treatment and zippers that are made to last. You need to feel comfortable when carrying your sling pack, and there should never be any prickly or tight features that make it hard for you to carry your gear. Now that you know what to look for, have a look at the different sling pack options available on the market for you to choose from. While it’s not much to look at, this fishing sling pack from Fishpond is the product of well thought-out design. It’s made from CYCLEPOND® recycled commercial fishing net fabric which is then coated with TPU welded fabric construction. It also features a YKK Aquaguard #8 water-resistant exterior pocket and a TIZIP® submersible zipper, which makes it fully waterproof, and it has a mesh back panel to keep you cool. 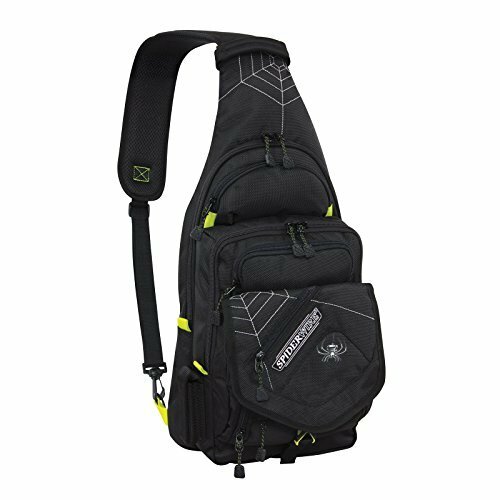 This streamlined pack from Spiderwire is made from a rugged polyester material, features a lightweight and compact construction ideal for day trips, and has an adjustable shoulder strap so you can wear it on the left and the right. Regarding storage, this fly fishing pack features multiple zippered pockets on the exterior, a padded pocket with fleece lining specifically made to keep your fishing sunglasses safe, and a bonus Medium Sized Utility Tackle box. It has plenty of interior pockets which are zippered and waterproof, ideal for keeping your gear organized and dry at the same time. It’s not large, but it does the job well enough. This hardy sling pack is surprisingly lightweight considering that it’s constructed from heavy-duty and waterproof 600D nylon fabric. The interior is conveniently padded with a layer of elastic cotton which is meant to prevent your gear from getting damaged when hauling the pack around. The pack also features a fair amount of storage, including 3 zipper pockets, the main compartment and 2 extra pockets on the inside to keep your GPS device and cell phone in. 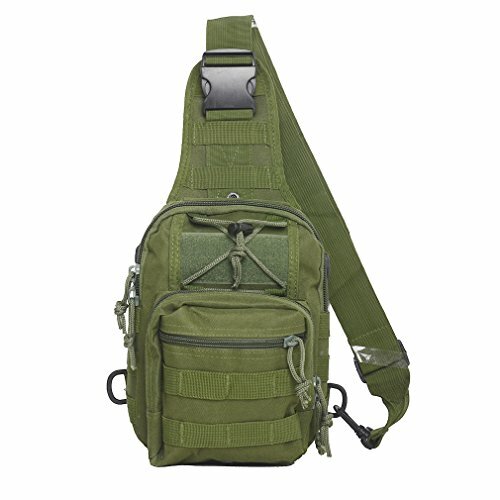 The front Molle webbing also provides additional storage to attach smaller items. Immediately noticeable is the amount of storage options that this versatile sling pack comes with, from hook and loops to an integrated net sleeve on the back panel, to a robust 3D outer pocket with rugged zippers, net sleeves and lash tabs, to a stretchy open-ended pocket on the bottom made to store your water bottle. 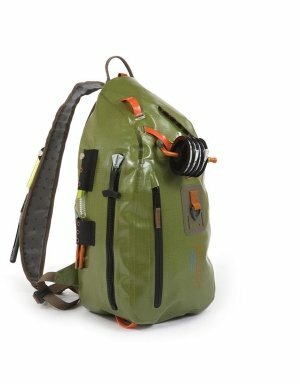 The pack is made from Cyclepond recycled fabric, and its strong construction includes Fishpond’s patented and signature molded drop down fly/cargo bench with outside hook and loop for fly foam attachment, YKK water resistant zippers, Flexible lash tabs for rod tubes and Hypalon attachment points. Color options for this pack include gravel and Tortuga. This super durable pack is constructed from a robust 410-denier nylon which is further strengthened by a waterproof coating along the bottom to protect your gear and valuables from water damage. It’s built for comfort as much as it is built to last and features a foam-padded shoulder strap, a ventilated back panel to keep your back cool during warm weather conditions, as well as a vibrantly colored interior with a magnetic anchor that makes it easy to find what you’re looking for. The storage is taken care of with an excellent zinger and tool attachment system that makes for easy access to your tools, a well-placed water bottle holder, internal pockets, and dividers as well as a cord loop and a convenient fly drying patch on the top of the pack! The attention to detail doesn’t stop there, as this pack comes with an internal Velcro strap for additional waterproof storage as well. Colors to choose from include either a combination of green and brown or olive and gray. 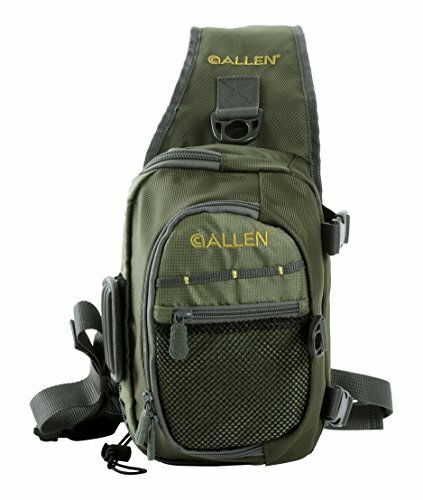 This pack has a wide-mouth opening that makes for easy access to your gear, as well as a ton of storage compartments in different sizes and designs, such as multiple D-rings, a water bottle pocket and a front pouch that transforms into a zip-down work station with tippet tender and fly patch. It also features high-viz lining for accessibility, while the shoulder strap is zippered to keep your essentials at close range for when you need them. 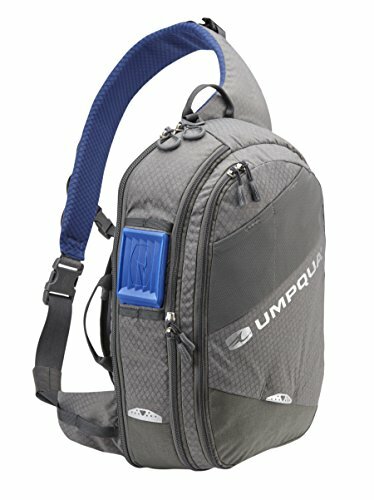 Umpqua has come up with a well-designed pack that’s made of 420 Denier nylon, and it features a variety of storage compartments. You can expect to find D-ring and web loops for net attachment, stretch-mesh pockets on the outside for tippet and accessory storage, an internal key clip and a spacious front pocket. The main compartment is also quite spacious and features a middle compartment that’s been divided to hold multiple fly boxes. The pack is built for comfort, with a padded shoulder strap complete with a back panel, and a lightweight and breathable design that makes it easy to carry. This compact pack is made from strong 410-Denier nylon and has a coated bottom for increased water resistance, and an internal Velcro strip on which to attach a waterproof pocket. It comes with a few well-placed storage pockets, dividers and bottle holder, as well as a unique zinger and tool attachment system and brightly colored interior lining for easy access to all your gear. It also features a foam-padded shoulder strap which is adjustable for all-day comfort and a molded back panel for further comfort. The cord loops are perfect for attaching a tippet bar, and there’s a fly drying patch on the top of the bag, in addition to Sternum straps to keep the pack in place and out of your way. Color options are green/brown and olive/gray. As you can see, modern-day fishermen (and ladies) are spoilt for choice when it comes to fly fishing sling packs. These handy packs make light work of keeping your gear accessible and mobile without disturbing your fishing activities. They're also available in a variety of styles, sizes, and colors to suit all types of applications and preferences. Just keep in mind to purchase a pack that meets your storage needs with the right amount of attachment points and pockets, and you'll be good to go! In a nutshell, getting a good quality sling pack is a great investment for any active fly fisherman, and you definitely won't regret shelling out the bucks for a good quality design. additional fly rod with out the tube, set up but taken down to half size. THAT would get my attention.